So is there a role for multi-touch iPad applications to improve customer experience in banking? Well most of our banking these days can be done in the complete absence of a banker. We do cash withdrawals and deposits via ATMs, we do bill payments and transfers via the internet and mobile, and we even apply for products like mortgages, credit cards and personal loans online these days – all without the need for a face-to-face interaction with a banker. Increasingly low involvement applications are moving out of branches because the branch doesn’t provide a value differentiation when it comes to the experience of applying for that type of product. If you walk into a branch what sort of thing might you still do these days? Well we used to walk into a branch to deposit or cash a check, but statistics show check usage in the western world is in rapid decline due to Internet banking adoption and electronic transaction capability. You might need to request a reprint of a statement, sign an important document related to your bank accounts or want to discuss an apparent statement discrepancy. You might wish to seek advice on a specific investment. There is still a role for the branch for certain types of human interactions that add value for a sales engagement or service opportunity. Which of those interactions might be improved by the use of the iPad? I’m not talking about Internet banking. The plethora of iPhone applications for mobile internet banking have already shown that the iPad has suitability as a tool for accessing your accounts, etc when you are on the move. But what about when you are in the bank? Is there a role for the iPad to improve the human element, to improve the interaction between banker and client? Well there is really only one interaction that is massively suited to the iPad – that is the High Net Worth financial or portfolio review meetings that occur within preferred banking or private banking engagements by a financial advisor or relationship manager. There are plenty of specialist software houses and banks alike that have had a shot at improving the standard of client engagement for this vital demographic, but at the end of the day the best financial advisors often just use a pen and paper to lead a client discussion. Putting a laptop in between a financial advisor and a client at this point of engagement is often counter productive – it can disrupt the flow of the conversation and can act as a barrier to the client getting real advice on his needs. Too often software tools that are used assume a one size fits all approach to clients and are ultimately a simple product recommendation tool. When clients come to their advisor to meet, they don’t want he or she jumping on a laptop to find out which product is right for them. They really want the advisor first and foremost to listen to their needs before making any recommendations. The problem with software interfaces designed to make those assessments is that the advisor has to ask so many questions to get a suitable recommendation that in the end the client feels like the review or interview is an interrogation, not an interaction to help facilitate a solution to their vital issue facing their family. The application interface if designed right, in partnership with the iPad as a device, could be a godsend for this interaction. It is a tool that could enhance the discussion with the client, and allow both the client and the relationship manager or advisor to take away key outcomes from the meeting. This could quickly and easily be integrated into the client’s internet banking account so that he sees exactly what was agreed, along with the suggested portfolio allowing him to do the execution online at home. Giving him key control over the most important element of the engagement which is the decision to commit to a specific investment in a particular asset class. KYC is taken care of as he’s an existing client and we just have to ensure that he ticks the correct boxes on the risk side when he clicks on ‘yes’ within the secure environment. It could even be that the review meeting ends and the advisor goes back to the office to select the most appropriate products in each of the specific asset classes targeted, so the client can do further research online later. Using the iPad in this way could improve the client engagement dramatically, but still make it feel like an honest to goodness advisory session rather than a product pushing process. The interface still needs to be super simple, but if it does everything the pen and paper can do, but in a structure, simple, usable fashion – it would be a huge improvement in client/RM facilitation. 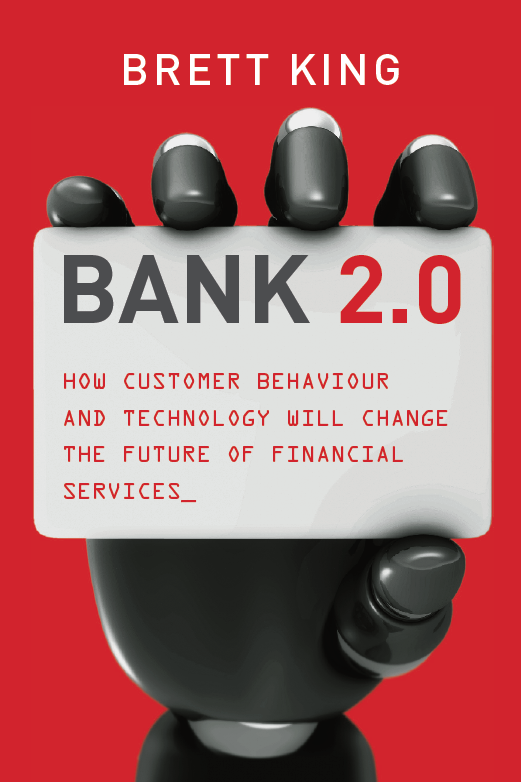 BANK 2.0 - Order Now on Amazon!